Here I was thinking I’d read eight books a month throughout 2016–and then started with four books in January. Ah, well c’est la vie (or however you spell that). They were all fun to read. With The Diviners, I got to completely immerse myself in a different era and thoroughly enjoyed it. I haven’t read much historical fiction, but I plan to now. The Roaring ’20s was an AWESOME setting for a book about “diviners” (kids with supernatural abilities) chasing down an occult bad guy. Deftly told from multiple points of view, I fell in love with the characters Memphis Campbell and Theta Knight (though Evie was actually the central character). Libba Bray has an excellent writing style, and I look forward to checking out the next book in the series, Lair of Dreams, as well as another Bray book I’ve heard good things about, A Great and Terrible Beauty. Libba Bray is married to her agent, Barry Goldblatt. I’ll be honest, the first few chapters of Magonia found me skimming a bit, but before long I was thrillingly engaged. What words can I use to describe the world-building? Extraordinary, striking, outlandish, whimsical, hallucinatory . . . and completely believable. It’s so hard to explain without giving away spoilers, so I’ll just say I’m grateful to Beth @ betwixt-the-lines for making me read this book. If you’ve read it, too, I’d love to hear your take on it. In 2005, Maria Dahvana Headley wrote a very different kind of book, non-fiction actually, called The Year of Yes. When Shonda Rhimes (of Gray’s Anatomy fame) recently released a book with the same title, Dahvana Headley was, shall we say, miffed and wasn’t afraid to say so. Publicly. On Twitter. Let’s see . . . what was my original reason for deciding to read this book? Right, I freaking love time slip stories! (If you have any to recommend, I am all ears–er, eyes?) It’s 1996, and Emma is one of the first kids on her block to get a home computer. Emma’s cute neighbor/former best friend Josh gives her a CD-ROM so she can load email onto her computer and, lo and behold, Emma magically gains access to her FUTURE Facebook account. The story is told through alternating chapters of Emma’s and Josh’s POVs, and I have to admit, the two voices were so similar I sometimes had to check the first page of the chapter to make sure whose POV I was reading. This is a complaint other readers have had, too, but it didn’t stop me from enjoying The Future of Us for what it was: a cute, entertaining, and a pleasantly quick read. 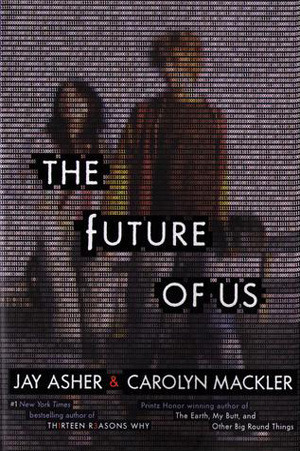 The Future of Us came to be because a teen fan asked Carolyn Mackler (a panelist at a book event) what her dream writing project would be, and Mackler decided she really wanted to collaborate with Jay Asher. As I type this review for the last of my January reads, I realize I read all four book exactly in order of how much I ended up liking them. Coincidence. . . or not? Yes, pure coincidence. 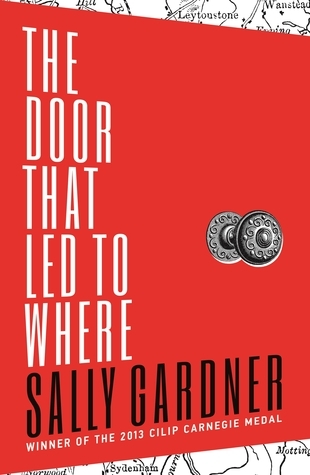 🙂 The Door that Led to Where was well-written in terms of descriptions and similes and all that (I especially enjoyed Gardner’s fun anthropomorphisms). I definitely wanted to keep reading ’til the end, but The Door that Led to Where didn’t get in-depth enough into the story it sought to tell. Good-natured 17-year-old AJ Flynn discovers a secret door to the past, which reveals important information about his true identity and puts him on the trail (perhaps in the path) of a murderer. I loved the scenes set in the 1830s (hmm, more historical fiction–I sense a personal trend), but my biggest complaint is that I never felt like I really got to know the characters. Because of undiagnosed dyslexia, Sally Gardner did not learn to read and write until she was fourteen. I’m glad to hear you loved A Great and Terrible Beauty–now I want to read it even more! I loved Magonia’s worldbuilding, but I felt the characters fell a little bit short. The Diviner is something I definitely need to read, I am just intimidated by the size but the setting sounds lush! I’ve never heard of the term time-slip stories but now that I have I totally want to read more stories about it! Well I like both and I will have to start reading more of both of them. That is interesting about the second book with the same title. It seemsthere would have to be a way to check that ahead of time. I wonder how often it happens. I hope you love ADSOM! It was in my top books of 2015. I love Jay Asher. He did a really great job writing Thirteen Reasons Why and I think you are really going to enjoy the Great and Terrible Beauty series. They are all really good and I couldn’t put them down. Also, this is my first time reading your page and I enjoyed it. I am always looking for new books to read and looking for bloggers who share the same passion for reading as me. I just wanted to say well done and I will definitely be reading more! Previous Previous post: A Moment of Gratitude. . .